Do you usually sleep on your back? Are you looking for the perfect pillow to support your sleep in this position? If so, you’ve come to the right place. Our favorite pillow for back sleepers is the Cradle Me Cervical Pillow, which comes in multiple heights to choose from. Our second favorite is the Pancake Adjustable Layer Pillow, which has six layers you can adjust for the ideal firmness. The best pillow for back sleepers will elevate your head to a neutral position, encouraging a natural curvature in the neck and spine. Too thick of a pillow will place your chin too close to your chest for comfort, while too thin of a pillow will make your head tip backward too much. Below, we’ve reviewed some of the best pillows for achieving a comfortable, physically sound resting position while on your back. We’ll follow that with some information about what makes pillows good for back sleeping. We’ve scoured the far corners of the internet to find the 7 best pillows for back sleepers available on the market right now. Whether you’re seeking to address neck pain, hot sleeping, or other issues, you’ll likely find a potential solution below. 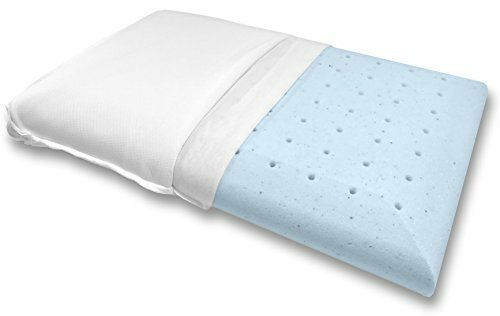 The Coop Home Goods Shredded Memory Foam Pillow uses bits of comfortable foam to cushion your head and neck. The hypoallergenic material molds to your body to support you and you can add or remove fill to reach your ideal density. This pillow is easy to care for – just throw it in the washing machine when it needs to be cleaned. The Coop Home Goods Adjustable Pillow allows for ventilation, so you don’t get too hot at night, and should be non-irritating for allergy-sufferers. It comes with a 100-night return policy, within which you can send the pillow back and get a refund. It also comes with a five-year warranty that guarantees it won’t go flat within that time. The Customsleeping Bamboo Pillow is very fluffy and soft, yet supports your neck and head well. The gel fibers and memory foam blend inside to mold to your body and cradle your head, easing pressure points, no matter which position you sleep in. The soft gel used in the pillow promotes airflow and provide a cooling effect, so you don’t get too hot while you sleep. Although it does use shredded foam, it doesn’t have issues with flattening or clumping like other shredded foam pillows. You get 30 nights to try out the pillow and return it if you wish and a lifetime warranty that protects you against factory defects. If you struggle with neck pain, Nature’s Guest Cervical Support Pillow may be what you’ve been looking for. It uses hypoallergenic materials and is especially comfortable for side and back sleepers. This pillow is shaped to encourage proper alignment in the spine, neck, and head as you rest. The Nature’s Guest Pillow allows you to shift effortlessly from side to back sleeping in the night and has supportive edges. If you need to adjust the firmness level, you can choose between either soft or medium density, by adding or removing filling. The cover is made with premium cotton and the pillow comes with a 30-day return policy, within which you can get a refund, if needed. If you know you like the feel of a flat pillow and also want a firm sleep surface for your head, you might consider the Bluewave Bedding Super Slim Memory Foam Pillow. It has a cover made from 40 percent bamboo-derived rayon and 60 percent polyester. While it works comfortably for all sleep positions, it’s especially effective for people who favor back or stomach sleeping. This pillow has a uniform shape with minimal contours and is infused with gel and ventilated to help you stay at a comfortable sleep temperature. 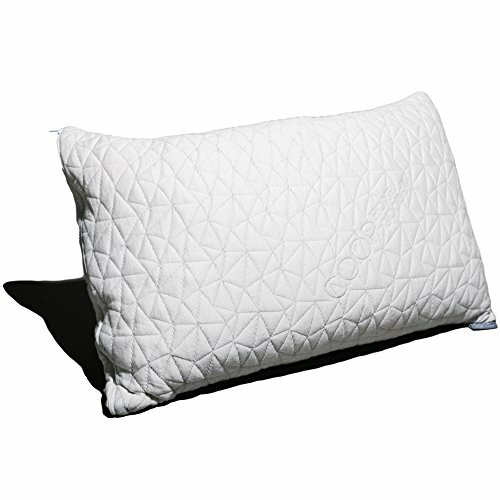 This pillow is hypoallergenic and the foam is supportive with a firm, sturdy feel. It comes with a three-year warranty but you must register your product by emailing [email protected] and provide your Amazon order ID within 30 days to be eligible for it. If you suffer from pain or tension in your neck, you may want to switch to a product like the Cradle Me Cervical Pillow. 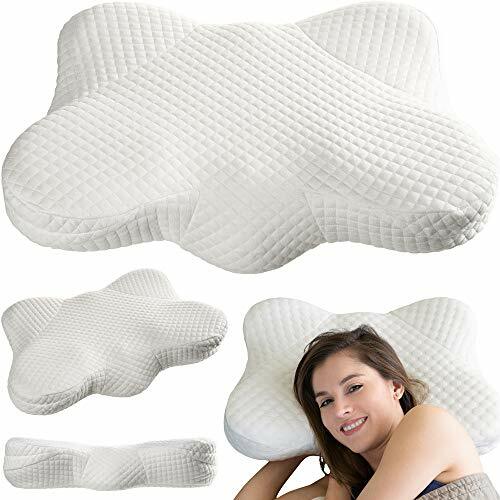 This contouring memory foam pillow has a breathable design that molds to your neck and head for comfortable support. While it works for all sleep positions, it’s especially comfortable for back and side sleepers. The unique shape of this pillow provides multiple heights for ultimate comfort and allows your back, shoulders, and neck to relax fully. Made in the USA, this pillow comes with a “Satisfaction 100 Percent Guaranteed” promise that allows you to replace it or get a refund if you aren’t satisfied. The Sleep Innovations Contour Pillow uses therapeutic memory foam that contours to your shoulders and head. If you’ve been struggling to find the correct level of support, this design could bring you the alignment you’ve been searching for. The pillow has a breathable, comfortable cotton cover and is made right here in the USA. This pillow allows you to choose between the two contoured sides (one lower and one higher) to find the height that’s right for you. The Sleep Innovations Contour Pillow comes with a five-year warranty to protect against defects and other manufacturing errors. 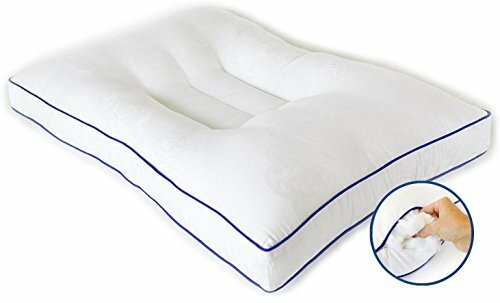 The Pancake Pillow Adjustable Layer Pillow has a unique design that you probably haven’t seen before. It has six stackable layers inside it that you can adjust to find the perfect height for you. Made with a soft down alternative material, this layered pillow works for all sleep positions and has a 100 percent cotton cover. Some nights you may want a flatter pillow and other nights a fluffy pillow. 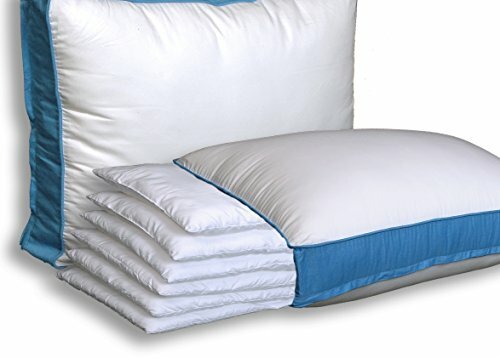 This product allows you to choose on any given night instead of having to keep multiple pillows on hand. The Pancake Pillow case has zippers on three sides which allows you to easily open and adjust the six layers, as needed. This pillow comes with a 30-day satisfaction guarantee or your money back (though you will have to pay shipping). 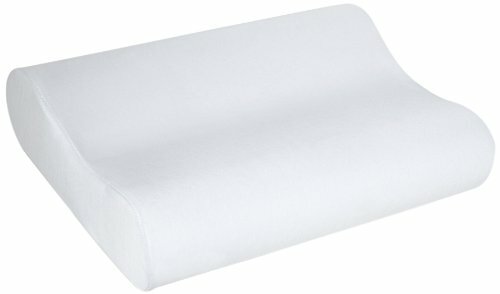 What Type of Pillow is Best for Back Sleeping? Most people already know how uncomfortable it can be to sleep with the wrong pillow, so finding the right option is an important matter. Sleep experts consider back sleeping the healthiest position of all because your back, neck, and head can rest naturally. What type of pillow is best for you if you are a back sleeper really depends on your body type and preferences. While a thinner pillow will work best for most back sleepers because it elevates your head only slightly for a neutral position, some sleepers may require a thicker pillow for adequate lift. While the perfect pillow thickness for adequate lift will depend on the size of the sleeper and other factors, all back sleepers will benefit from a malleable and supportive pillow. This ensures that your head is kept upright and relatively level instead of turned to one side, which can cause neck pain. Why is Using the Right Pillow for Your Sleep Position so Important? The sleep position you use night after night has a direct impact on your overall health. It affects your spinal alignment, your breathing, and how rested you feel when you wake up in the morning. When you take the time to use the correct pillow for your preferred sleep position, you’re doing yourself a huge favor. Your sleep position and pillow will work together to comfortably support your spine, neck, and head. While both standing and lying down, a neutral spine position is very important for comfort and health. A neutral position keeps your neck and back in a position that takes pressure off your nerves, muscles, and discs. You’ll fall asleep faster: When your body is resting in a neutral, healthy position, falling asleep is much easier. With the wrong pillow, you’ll toss and turn endlessly, trying to make up for the awkward discomfort your pillow is causing. You’ll stay asleep: Not only will the right pillow for your sleep position enable you to drift off easily and quickly, you’ll also stay asleep instead of waking up continuously throughout the night. Getting deep, unbroken sleep is essential for daily health and mental outlook, so this is worth prioritizing! You’ll find relief from pain and tension: Resting for hours at a time with your body in the wrong position leads, unsurprisingly, to pain and tension over time. When you use a healthy, supportive pillow that fits your preferences and needs, your body finally gets a break. After finding the perfect pillow, you may find that before too long, you’re waking up free from the pain that plagued you previously. You’ll have increased mental focus: Quality sleep is essential for clear thinking, memory, and focus. When you don’t sleep enough, you’re functioning far below your capacity. Although people think they can adjust to this, it will end up having a negative impact. Finding the right pillow for you will enable you to feel more focused and alert throughout the day. The best pillows for back sleeping can come in all shapes, sizes, and filling types. Let’s look at some of the most common pillow fillings below, so you have a clearer idea of which will work best for you. Memory foam became a wildly popular bedding material because it conforms to your body’s unique shapes, relieving pressure. While a memory foam mattress is a worthy investment for many sleepers, it’s also expensive and a memory foam pillow can provide pressure relief without breaking the bank. Shredded memory foam provides the benefits outlined above but has a more shapeable and malleable texture. Since a solid piece of memory foam can feel too firm for some, shredded foam is more customizable. Many shredded foam pillows even allow you to add or remove foam to fit your own preference. 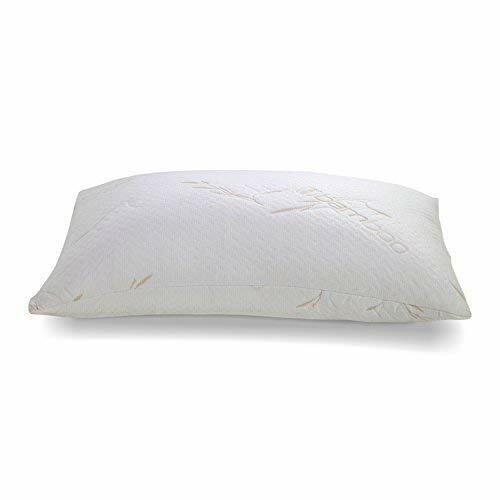 Duck and goose feathers are a classic pillow filler because of their springy and durable texture. Most feather pillows have some down mixed in to create more softness. Overall, feather pillows are comfortable, long-lasting, and provide a temperature-neutral sleep environment. Down is the layer of soft feathers closest to a bird’s body and makes for a malleable, plush pillow filling. This material is usually selected for comfort alone and not support, although there are firm and supportive down pillow options out there. Also known as polyester fiberfill, synthetic down is a plush material that maintains its shape well over time. A suitable alternative for people with feather allergies, synthetic down tends to be more affordable than real down and often feels very similar. Buckwheat pillows are made from buckwheat hulls and are often organic. This contouring material provides firm support and may be a great option for people who are environmentally conscious, as it’s a sustainable material. Latex pillows have a responsive feel instead of the cradling contouring of memory foam. This material is known for being hypoallergenic and can come from either natural sources (like the rubber tree) or synthetic chemicals. Latex provides springy support and also sleeps very cool. Before you decide on the right pillow to support you as you sleep on your back, there are some considerations to make. We’ll outline some of these below. You may not have given much thought to the way you lie on a pillow, as this action seems fairly straightforward. But the way you do use a pillow can actually have a big impact on the way you feel when you get up. Back sleepers should push their pillow down so that it’s next to their shoulders, but should keep their shoulders off the pillow. When your head is on the pillow, it should be level with your body, your ears parallel with your shoulders and your chin shouldn’t be tucked to your chest. Also, make sure that your chin is not pointing upward and that your head isn’t tilted or rotated either left or right. To get a high-quality pillow, you’ll have to spend a bit more than you would on an average pillow. You can expect to pay around $25 minimum for a quality choice, but some pillows can cost up to hundreds of dollars. The seven top pillows we review in this article, however, are priced between $30 and $90. If you’re going to invest in a good pillow, it may be slightly expensive. For this reason, it’s a good idea to have an idea of the warranty and return policy offered by the manufacturer. Read over this and, if it isn’t immediately available, contact the seller to find out before you buy. If you buy a pillow and it doesn’t feel comfortable at first, it doesn’t necessarily mean you made the wrong choice. Some pillows (especially memory foam) will need a break-in period. In most cases, seven days should be more than enough time to figure out whether you’re using the right pillow for you or not. Q: What are the benefits of an adjustable pillow? A: It’s easy to get a pillow that’s too thin or too thick for your needs. With an adjustable pillow, you’ll more or less know that you’re making the right decision because you can add or remove filling until you reach the right firmness level. If you do buy a non-adjustable pillow, make sure it has a return policy, so you can send it back if it’s not the right fit for you. Q: Why is a firm pillow important for sleeping on your back? A: While sleeping on your stomach or side can work with a softer pillow, back sleeping requires a firm pillow. This is because your head may tilt to either the left or the right while you rest, causing misalignment in your body. With a pillow that’s firm enough to hold your head in place, you can rest all night with a natural curve in your spine and wake up refreshed. Q: How else can I address body pain apart from the right pillow? A: Perhaps you’re reading this article because you wake up with pain and want to fix it. If you sleep on your back and need to fix tension or discomfort in your body, you may try placing a pillow under your knees to encourage your spine’s natural curve. In addition, you should make sure you’re using the right mattress. With the wrong mattress type for your needs, the best pillow in the world won’t make a difference. 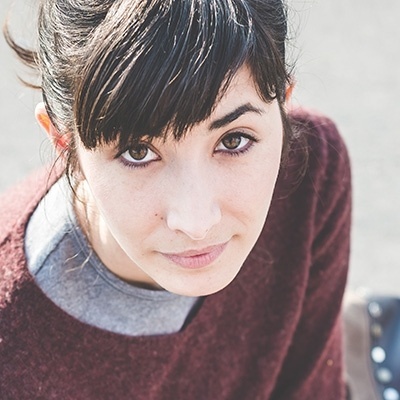 Q: Is sleeping on my back healthy for my body? A: If you’re strictly a back sleeper, you’re in luck! This sleep position is considered the healthiest by sleep experts. This position keeps your head, neck, and back in alignment while easing pressure. Just make sure you’re supporting yourself with the right mattress and pillow and you’ll be good to go. Overall, sleeping on your back is a great idea and the right pillow can help you rest most comfortably in this position. We chose the Cradle Me Cervical Pillow as the best option for back sleepers since it has varying height levels that allow you to choose the best fit for you. Most back sleepers will do best with a thin or adjustable pillow that keeps their head aligned with their body. But, at the end of the day, the final deciding factor for which pillow you should use will be up to your own preference. 6 Best Bamboo Pillows of 2019: Should You Invest in a Cool, Contouring Pillow Made with Natural Fibers?